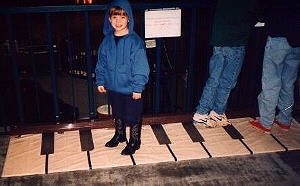 Giant pianos, perfect for teaching music to kids as they get a little exercise! These were built for Mike Storie's Musical Water Fountain at "Beyond Fast Forward", but have been receiving plenty of abuse at parties and the interesting Sesame Street shoot with Mike's Fountain. There are two of them, each two feet by eight feet, and they function just like the pianos in the movie "BIG" - with the exception that these Einways are polyphonic MIDI controllers. At home I set them up with all kinds of sounds as my kids run up and down on them, jump, and sing. Caution: Playing "Chopsticks" on the Einway Pianos can be hazardous to your health. Please use the Buddy System when attempting to play octaves.